Tuesday, September 11 at 1:00 pm at Killingworth Library. 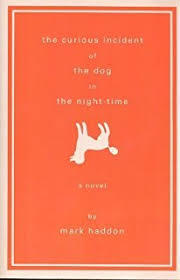 Join us as we discuss The Curious Incident of the Dog in the Night-Time by Mark Haddon. The novel’s main character, Christopher, is a 15 year old who solves the murder of a neighbor’s dog and finds his supposedly deceased mother by marshaling the strengths of his intellect. Often cited as a novel about Aspergers syndrome, the author describes it as “ a novel about differences, about being an outsider, about seeing the world in surprising and revealing ways.” This book is one of those on the PBS Great American Read list. (The Library has compiled its own list and both can be found at the circulation desk along with instructions on the related Library contest.) Extra copies will be available at the circulation desk. Newcomers always welcome!